Test rider was ones again Philipp Hess and comments/advices during the testing was made from Sebastian Heinze. 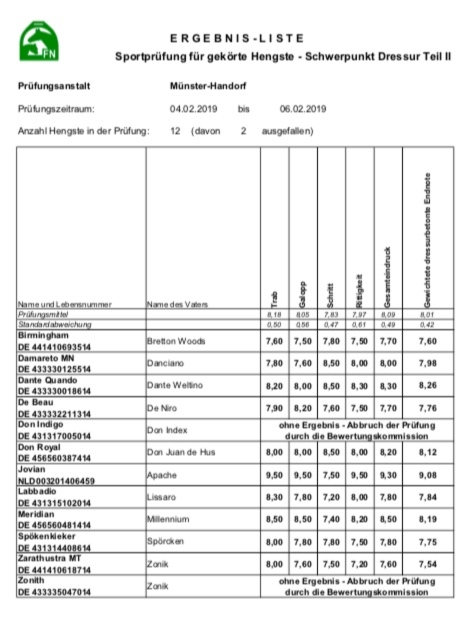 The first day doing a test with own rider where Jovian and Eva Möller showed an outstanding qualities, and today the test rider Philipp Hess clearly enjoyed his testing while rewarded Jovian with a clear 10. Gaitano - ones again a top presentation and preparation from Beatrice Buchwald which made today’s 4 year old winner. Both Escamillo and Tesla with big expectations. From H2R point of view a bit harsh judging of Escamillo from the test with own rider, as both rider and horse clearly were a bit affected by the “pressure”. Without doubt a future top stallion. Tesla with Helen Langehanenberg did not really live up to H2R expectations. He seems a bit hurried for the trot work and does unfortunately not at the moment bring the stallion format.